J.R. Burkholder had aspirations of joining the U.S. Air force when he was in high school, even making a painting that depicted an airplane dropping bombs and shooting another plane. Somewhere in the 65 years between his high school days and now, his mindset shifted from a militaristic viewpoint to a focus on peace. On Tuesday, Sept. 14, the retired Bible and Religion professor published “Prophetic Peacemaking,” a collection of essays on faithful living. Through his essays, dating from 1956 to 2004, Burkholder tackles the question of what it’s like trying to be a faithful Christian in the 20th century. Although Burkholder wrote all the essays in the collection, it wasn’t his idea to compile them and publish it as a book. 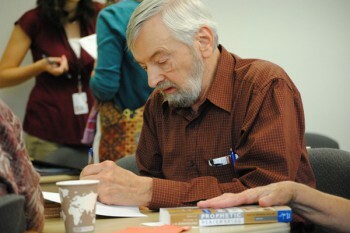 It was Keith Graber Miller, professor of Bible, religion and philosophy, who saw the importance and relevance of Burkholder’s work and edited the essays into the book over the process of five years. This book is partly about honoring Burkholder, explained Graber Miller, but also has value as a documentation of history through looking at the development of theology. “J.R. and I intend for these essays to function not simply as ‘period pieces,’ but as reflections on faithful living that are yet relevant for future generations of peacemakers,” said Graber Miller. Using the idea from the philosopher Isaiah Berlin, Graber Miller described Burkholder’s way of learning as more of a fox than a hedgehog. Applying this ‘knowledge of many things,’ Burkholder writes with hopes to engage his audience to reflect on their life callings and faithful communities in order to make choices for peace.